Brown beef and onions. Add tomatoes (chopped slightly) and tomato paste, water and spices. Simmer, uncovered, about 30 minutes. Meanwhile, cook lasagna. 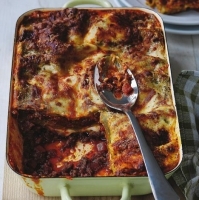 In a 12 x 9 x 2-inch baking dish, spread 1 cup sauce, then alternate layers of lasagna, sauce, Ricotta cheese, Mozzarella and Parmesan, ending with sauce, Mozzarella and Parmesan. Bake at 350° for 40 to 50 minutes. Let stand 15 minutes before cutting and serving. Serves 8. Recipe can be doubled for large groups. Freezes well. 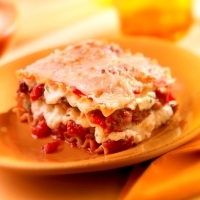 Recipe categories: Ground beef, Beef, Lasagna.